The Spectrum retreat is a good looking game with a fascinating story and smart puzzle mechanics. This game has been developed by Dan Smith, winner of the BAFTA Young Game Designers competition (Game Making Award 15-18y), and has been published by Ripstone. This game has been released for PC, PlayStation 4 and Xbox One, and will soon be released for the Nintendo Switch. You wake up in a nice hotel room. You wake up from a call on your phone, and as you cross off your calendar, you’ll hear a knock on the door. There’s the host, standing in the doorway, wishing you a good morning and suggesting you should get breakfast. This seems like a great morning, until you get your phone, and a lady named Cooper explains that there’s something wrong with the hotel, something wrong with you being here, and something wrong with the hosts. As you play, you’ll learn about your life before you woke up in the hotel, and about what the hotel actually is. The story is being revealed through the narration of Cooper, trough audio logs, and through objects from your past you’ll encounter more and more as you go on. While this is an interesting way to tell a story, you’d encounter certain objects over and over again without a logical explanation, objects which seemed unnecessary to repeat that many times. As you play you’ll discover quite a sad story about your past, something that Cooper insists you have to remember for yourself. As you go on, you’ll learn what the purpose of the hotel is, and gradually learn how you ended up inside of it. Pretty, even though the hotel looks a bit clean and sterile, but that fits the theme of the game. The featureless robots who are the servants of the hotel look rather creepy, which works very well for the game. The graphics can be really disconcerting sometimes, especially when the whole hotel starts glitching around you and you’ll still have to behave normally. Clues and important objects are easy to spot, so you won’t miss any parts of a puzzle easily. The puzzle levels in the ‘authorization’ areas look cool and are very well designed! You solve puzzles with colors, which you can absorb and transfer to glowing cubes. These cubes cast their own light around them, illuminating the whole room, and transferring colors onto moving blocks really creates a gorgeous visual effect. The glitch effects you’ll often see when you’ll progress look great, making it clear what’s real and what’s not. The sound is well done! The game has a nice soundtrack, and as the levels get more glitchy, the soundtrack changes to match the glitchyness. The voice acting is very good as well! At the puzzle levels you’ll miss the voice of Cooper, which has a proper in-game explanation and is logical gameplay-wise, but it would have been cool to hear her more often. She does get impatient easily as you walk around the hotel to get you to your next objective ASAP, which is kind of annoying, sometimes. The hotel staff has several voice lines, with subtle changes each cycle (day), which is really interesting to pay attention to, since it fits well into the story. The sound-effects also fit the game really well. 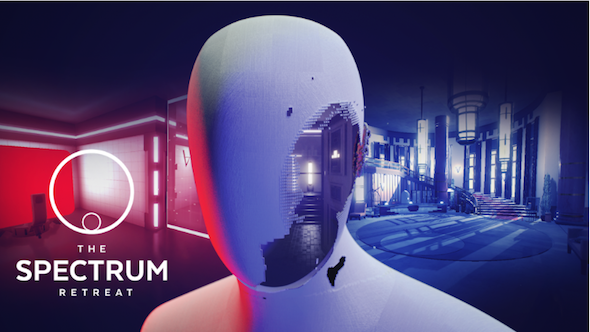 The Spectrum Retreat is a puzzle adventure game. This game has really innovative, challenging and fun puzzles, and an interesting storyline told outside of the puzzle areas. 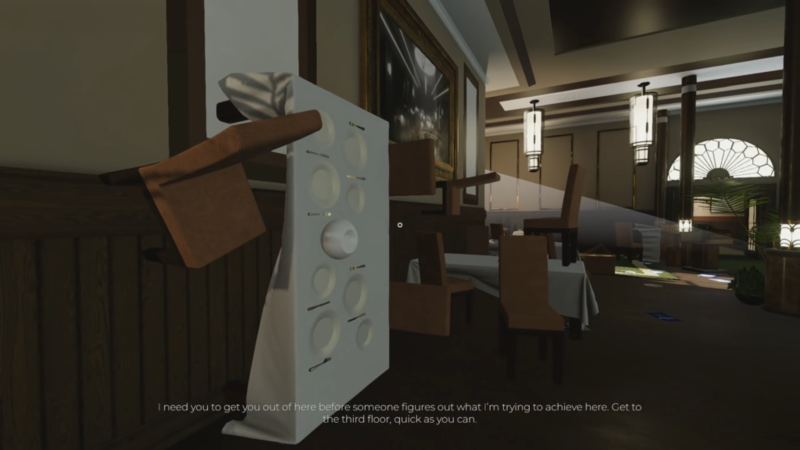 You’ll notice that the storytelling part of this game has a sort of Groundhog-day like setting, where you’ll experience the same day over and over again, where you need to follow routine so you won’t raise suspicion under the personnel of the hotel. But to get further into the game and the story, you’ll need to explore other floors of the hotel, and to do that, you’ll have to gain authorization, which you get by completing a series of puzzles for each floor. 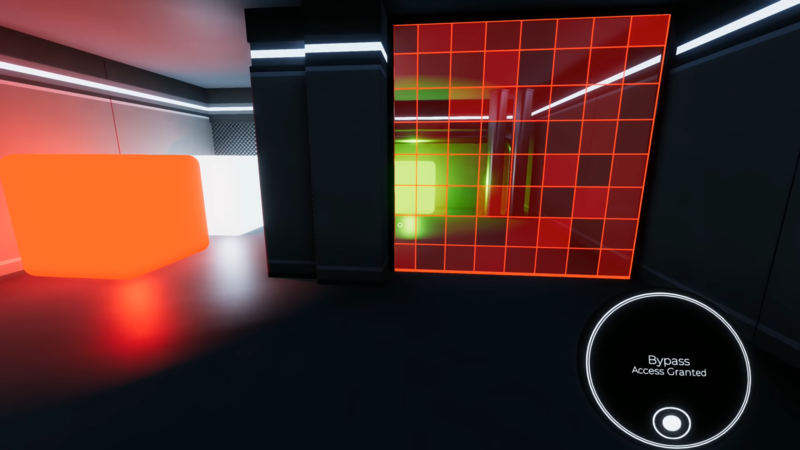 The puzzle rooms are a unique area with a more industrial or lab-like feel, with glowing cubes which you can use to absorb and exchange colors. The story is interesting, and functions well to link a whole bunch of puzzle levels together, and at the same time offers a bit of variety to the game. 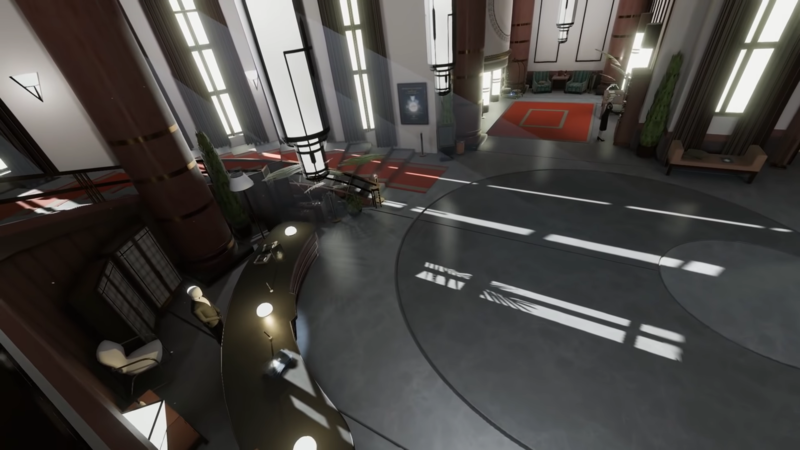 The storytelling part and the puzzle parts do feel a bit separate, but they are pulled together by the fact that you’ll be able to find hints about your past in both settings. The story won’t be revealed too quickly, keeping you playing to see what comes next. More areas of the hotel open up as you follow the story, keeping the hotel interesting to explore, despite experiencing the same day over and over again. 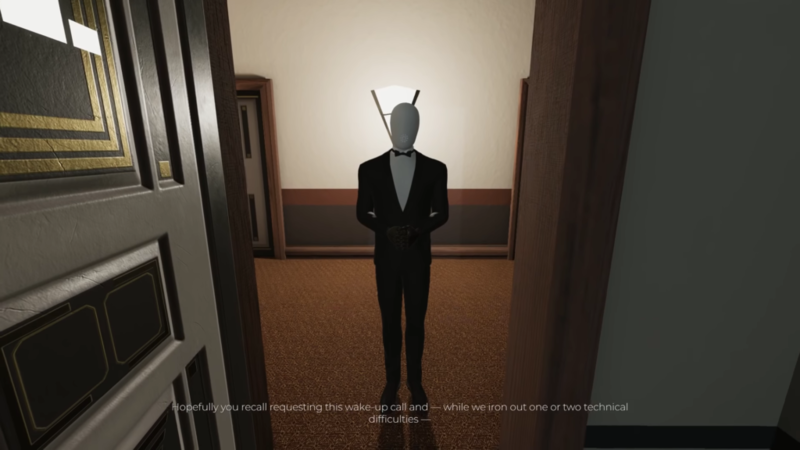 The voice of Cooper urges you to delve deeper into your past and explore the hotel, while at the same time following your daily routine and keeping a low profile towards the creepy robotic staff of the hotel. This makes you rather paranoid and suspicious towards the crew, which works really well to build suspense. The puzzles themselves are a lot of fun! Most of the puzzles rely on opening or closing doors or other surfaces, using colors. You’ll be able to absorb a single color on a smartphone-like device you carry, and you’ll be able to transverse through a surface with the same color as your device. There are cubes with colors scattered around each level, and as you absorb one color, the cube will turn white, and if you take another color, the cube will turn into the color you were holding. 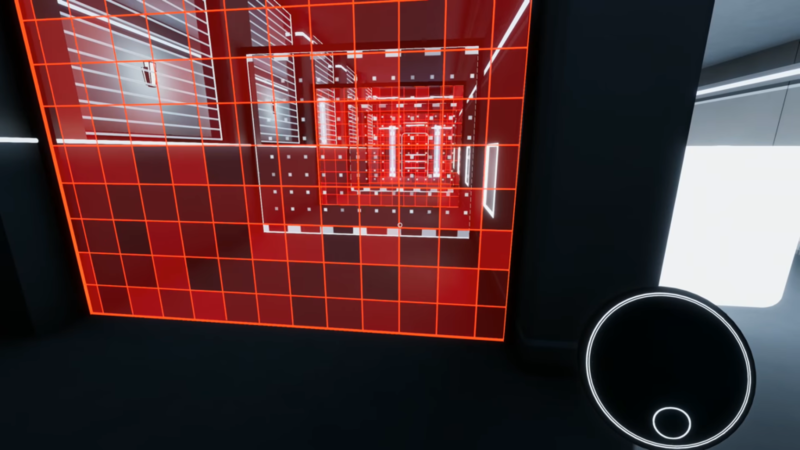 Many levels consist of an intricate series of doors and bridges in several colors, for which you’ll need to line up colors in the right order on the available cubes. Often you’ll need to find certain colors somewhere far away or locked behind a colored screen, and you’ll need to work out a way to transport that color to the place where you need it to open a door. Gradually new mechanics will be added to the levels, like cubes which change back into their original color after a set amount of time, basically erasing whichever color you put on them. Then you’ll learn to teleport to pads of the color you are holding, and eventually even change gravity so you’ll be faced with a whole new configuration of the room you were puzzling through. However, using these mechanics, it is possible to get trapped accidentally. If you make a mistake like that, you’ll often have to restart the challenge, which does break immersion a bit. The Spectrum Retreat is a fun puzzle game, with innovative and unique puzzle mechanics. The game also features an interesting story to string the series of puzzles together, which works well to offer some variety in the game. The game looks absolutely beautiful, and both the soundtrack and the voice acting are well done. This game is recommended for fans of puzzle games who’d like to experience a whole new type of fun puzzles!